Update 2/29/12: The Galaxy S II is now available for sale. Unfortunately, the device is not one of U.S. Cellular's upcoming LTE devices, as it will run on the carrier's current 3G network. Availability hasn't yet been announced, but you can sign up for e-mail updates at U.S. Cellular's GSII landing page. The device will intro at $229.99 after a $100 mail-in-rebate with a two-year agreement. CHICAGO (Feb. 21, 2012) – U.S. Cellular (NYSE: USM) and Samsung Telecommunications America (Samsung Mobile) announced the upcoming availability of the Samsung Galaxy S® II. The Android™-powered smartphone is designed to deliver advanced multimedia features with a powerhouse 1.2 GHz dual-core processor. The 4.5-inch Super AMOLED Plus display shows brilliant colors, providing a vivid and crisp viewing experience. The Galaxy S II runs on U.S. Cellular’s high-speed nationwide 3G network, which has the highest call quality and network satisfaction of any national carrier. It will be available for $229.99 after a $100 mail-in rebate. The Galaxy S II is ideal for the multi-tasker who also wants easy access to entertainment wherever they go. You can quickly update your calendar and browse the web to read the latest news, check the weather or get driving directions. The multimedia functions allow you and your family to keep up with your favorite TV shows and keep the kids entertained while you’re traveling with HD Games. With its superior screen display, camera, webcam and access to thousands of helpful applications in the Android Market™, customers will be able to get more done throughout the day. Smartphone enthusiasts who switch to U.S. Cellular get unique benefits, like new phones faster without continuously signing contracts, free Overage Protection and can participate in U.S. Cellular's Trade-In Program. Through the U.S. Cellular Trade-In Program, customers can receive up to $150 on qualifying smartphones by trading in their current phone. U.S. Cellular offers customers the only points-based rewards program in the industry to get benefits for doing simple things like paying their wireless bill on time, adding a line or referring friends and family. Points can be used for new phones faster, additional lines, devices, accessories and ringtones. It’s one of the reasons U.S. Cellular has the happiest customers in wireless. For more information about all of U.S. Cellular’s deals, plans and phones, and other restrictions on these offers, visit any U.S. Cellular store, go to uscellular.com or check out U.S. Cellular on Facebook. 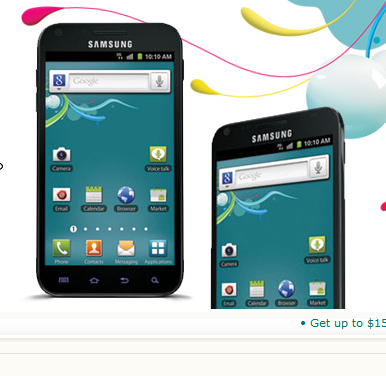 The Samsung Galaxy S II will be available for $229.99 after a $100 mail-in rebate. Purchase of a data plan is required, and a new two-year agreement and activation fee may apply for new customers. Additional terms, conditions and/or charges may apply.